In this 4-part series, we explore goddesses related to each of the four seasons, starting with Brigid, beloved Celtic triple goddess of healing, word (written and spoken), and smithcraft or the alchemy of fire during the cold winter months. The springtime is devoted to Inanna, the intrepid goddess who journeyed into the Underworld and back to release her wounds and claim her sovereignty. She teaches us to do the same. The summer brings us the power, passion and prowess of Artemis, goddess of the hunt and moon. Originally a mother goddess, she carries the archetypal energy of the activist, athlete, mentor, and independent woman. In the fall, we meet Cerridwyn, the sorceress and mother/crone shapeshifter whose lessons are about transformation in the cauldrons of our being. While this course was designed to work with a different goddess each season, you can choose to work with one, two, three or all four goddesses whenever you like. It is suggested you start your work with a particular goddess on the New Moon, which is the beginning of a lunar cycle that last about 29 days, the same as a woman's menstrual cycle. The magic and mystery of the goddess is there for each of us when we feel called to work with a particular archetypal feminine energy. Sometimes we consciously seek a goddess and archetype to work with and move into, and other times an archetype is activated within us without our consciously knowing why or what is moving through us. Consciously working with a goddess archetype helps us bring this feminine energy into full power, allowing us to learn from these goddesses as spiritual guides. Brigid is a Celtic Triple Goddess of Poetry, Metalwork and Healing, celebrated at Imbolc (also known as Candlemas) on February 2. She teaches us to stand in our fiery, creative power as brave women with strong voices. We will create poetry, make candles, and craft goddess rosaries with Brigid's inspiration during this lunar cycle. Guest artist, Jennifer Mantle, will lead us in making rosaries of the goddess of your choice. Inanna is the ancient Sumerian "Queen of Heaven and Earth," whose epic story contains the initiatory descent to the Underworld, Her Death, and Rebirth. She is symbolized by Venus, the ruling planet of Taurus, which is visible as the Evening Star 250 days of the year (Her Descent) and the Morning Star 236 days of the year (Her Ascent). She teaches us to go to our depths, to sacrifice the surface or false image of our ego, find the gold of our True Self, and return transformed. We will make shadow boxes, and through this process, find and reveal the hidden parts of ourselves. Artemis, also known as Diana, is a Greek Goddess of the Moon whose roots extend back to Her time as a many-breasted mother goddess. 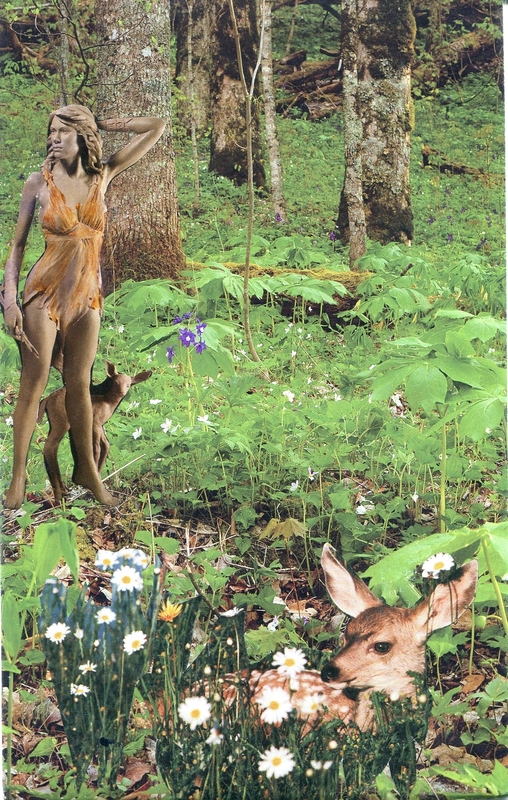 We know her better as the maiden Huntress who lives in the forest with her band of young girls (the Arktoi) and her totem animals of Deer and Dog. As a virgin goddess, she is whole unto herself and teaches us to live our wild, instinctive nature, and at the same time, honor our sisterhood. We will make spirit dolls from treasures found in nature (leaves, twigs, sticks, shells, pods, seeds, clay) during this session. Cerridwyn is a Celtic Goddess, a shape-shifting mother/crone, who stirs the cauldron of inspiration and transformation for a year and a day. She knows the ways of the Otherworld and can lead us to meet our ancestors and spirit guides when the veil is thin and we are ready to walk through. She is a healer, witch, and wise woman. She teaches us to honor our magic and to transform within our own cauldron. Guest artist and Herb Mother Latisha Guthrie will lead us in wild and woolly potion-making. You will receive an e-book (PDF download) in your email inbox. It will contain beautifully illustrated pages full of lore, legend, journal prompts, rituals, ceremonies, altar-making, instructions, and totems. Each includes an arts and craft tutorial related to the teachings of the particular goddess. There will be audio guided journeys contained within the PDF for each course and some videos. All of the divine feminine abundance you will be receiving is transformative to your mind, body, soul and spirit. You will learn how to gain wisdom from, relate to, and reflect these powerful feminine archetypes. "This journey has been wonderful. I've learned so much I didn't know, thanks to you, Stephanie, and to my brilliant, generous, spiritual sisters who have shared your goddess experience and knowledge with us. I have really loved the art, as well as the stories. I don't have a complete sense of all the openings yet, but it's been really heartening to connect with other women here and to open myself to the goddesses's wisdom and guidance. I'm sure more revelations will be coming. I also love celebrating the cycles of the moon. Stephanie, you have done a superb job of creating a sacred space and entertaining format. Much love & gratitude to you and all." - Lauri M.
"This class and all that I have learned and shared was tremendous. So much so that I have my first Wise Woman Circle set up and ready to go... Thank you all, my wise, strong sisters for sharing your abundance of love and compassion." - Deb S.
"I have gotten so much from each of you and from the divine Stephanie Anderson Ladd here in our Temple. Tending my altars has nurtured a constant and strong connection to my spirituality and Goddess embodiment even when I am busy with worldly concerns. I found it so striking that I had rather dismissed both Mary and Guinevere although it has been my practice and desire to throw off the shackles of patriarchal mindlock as long as I can remember. Mary came to me late last year and dissolved any question in my heart of who She is, but I hadn't reclaimed Guinevere and I am grateful to walk with this Queen... for my name's sake! Thank you and blessings to you each and every one." - Jennifer B. "I will take ANYTHING from Stephanie" from now on! This has been even more amazing than the Alchemical Goddess Temple. Go ahead, test me: offer Nose Picking 101 and I'll sign up! It doesn't matter to me who we work with; I know it will be deeply resonant and personal and transformative. Thank you for sharing YOUR magic and inspiring me to share mine, sister." - Kate S.
"My experience of this Goddess Mystery School has been life-altering! And goddess knows my life needed altering.... Thank you Stephanie for holding this Temple space for us!" - Saacha K.
Additional self-study e-courses are available!